This poster takes as its central image a photograph entitled Victory! (1945), showing celebrations as the crew of an American submarine (powered by diesel engines) returned triumphant at the end of active service in the Second World War. 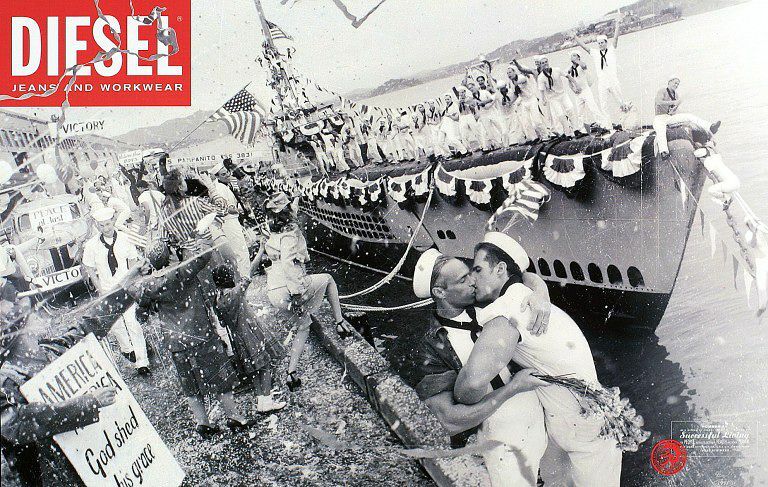 An image of two sailors kissing is superimposed in the foreground. The clothing company Diesel appropriates such 'found' imagery to promote their jeans and workwear to its target youth audience, and to position the company in a culture of growing political and social awareness. 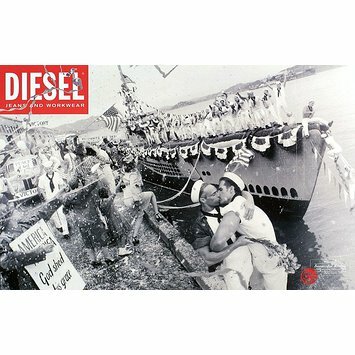 The poster's design features a black and white photograph which depicts the celebration of sailors coming into harbour. The photograph has a mock-vintage look with a facsimile date of 1945, indicating at first glance that the image relates to the traditional views marking the end of World War II. A closer look reveals the image of kissing sailors. The design was part of the "For Successful Living" campaign by Italian clothing company Diesel. Poster for Diesel by Joakim Jonason at DDB Stockholm, with photography by David La Chapelle, 1995.